This week has been heavy with revelation and anticipation, and I can't wait to share what God is doing. Earlier this week, a verse began haunting me. I saw it everywhere: in a book I am reading, Pinterest (and they even made it all pretty! ), a sermon I had recently listened to and was popping back up again on social media. I know when God gives me a verse over and over like this (hello, be still and know, I see you!) that it's time to starting digging in. What an amazing verse -- but the revelation stopped there. I prayed on it, and God kept whispering to me "dig deeper". I listened to that sermon 3 times (I will share the link at the bottom of this post - you don't want to miss it! ), and found a nugget that stuck out to me. I read the scripture immediately surrounding it that supported the nugget from the sermon, but nothing more. I spoke to my husband, friends, people in my life about the verse, and nothing was clicking. No ah-ha moment. I dug into specific words and looked up their meaning in Greek and Hebrew - y'all, I WAS DIGGING. And there was NOTHING to be found that made sense. Until it did. See, in the sermon, Pastor Steven (Elevation Church) talked a lot about verse 18 "but forget all that (the miracles) - it is nothing compared to what I am going to do." Remember the miracles God has done, but then forget them. What? God wants us to be reliant on the source, not the system. Jesus healed multiple blind people - but He did it a different way every time. I have hurts He wants to heal, but it won't be done in all the ways I'm used to. 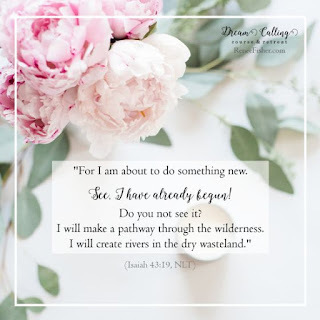 I reached out to one of my pastors who spent some time with me connecting the Isaiah verse to John 1, and how John the Baptist is making a way for Jesus. He told me "perhaps the John the Baptists in your life are all these current ways God is saying to you "I through Jesus, have something new for you!" ". [Can I pause for a minute and just say, I am surrounded by an amazing faith family, and I am so grateful for the time they take to build me up, pray for me, and love me. You should find this, if you haven't already]. I had been reading this passage over and over and tried to push the idea that this was my ticket to fertility, the promise of conception that we've been longing for for the last 3.5 years. I didn't want another Word from God to be about fertility, when my husband and I finally laid that to rest. Every time I concede my desires, it seems God brings it back up again. To be totally honest, it's incredibly frustrating and confusing to feel like I'm constantly ripping open that wound that I keep trying to heal. Notice, though, I keep trying to heal. Infertility is an emotional roller coaster, one I don't wish on anyone. 1 in 8 couples experience this heartbreaking battle, and we all handle it differently, all with very different but similar journeys. I have clung to Jesus and pressed into His name, learning more about just how much He loves me, even though I feel physically broken. Knowing that God might be stirring this back up in my heart again, I ask Him why. I know He wants to show me something, but I'm banging my head against the desk trying to figure out what it is. I want, so desperately, what He wants for my life. But this control freak side of me really struggles with not having answers. Feeling that stir causes a bit of panic. 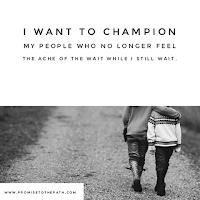 I don't want this to consume my heart anymore - it becomes a nasty weed that chokes out the goodness in my heart, and I feel bitter, resentful, and even though I can have good days, it's marred with hurt. My husband feels it, my friends and family feel it - it's like a disease that oozes out onto every word I taste. I'm stuck in this balance of not wanting to give up hope, but not wanting this obsession to take root again. And that's when it hit me. I've made fertility an idol. I think on it daily, allowing it to marinate in my soul. I constantly talk about it, pray about it, read about it. I obsess over cycles and ovulation and schedules and tracking all the things. I use it as an excuse to isolate. I throw money at it willingly, without a second thought. I've allowed this infertility to disrupt my life, instead of being merely a circumstance of it.Worst of all, infertility has become my identity, and I've allowed it to define me, rather than allow Jesus to do that. My pastor said: "He is making a pathway and clearing the way for you. In order for that to happen, it almost always requires of us that we remove our focus off of our selves and placing it on Him. Keep doing that, and watch what He does!" Isaiah 44:21-23 "Pay attention, O Jacob, for you are my servant, O Israel. I, the Lord, made you, and I will not forget you. I have swept away your sins like a cloud. I have scattered your offenses like the morning mist. Oh, return to me, for I have paid the price to set you free. Sing, O heavens, for the Lord has done this wondrous thing. Shout for joy, O depths of the earth! Break into song, O mountains and forests and every tree! For the Lord has redeemed Jacob and is glorified in Israel." The Lord made me - infertility does not have a say on who I am. The Lord will not forget me. He is preparing a path, and it will be far from the well-beaten way. Change is coming, a new path is nearing our lives; that may be in the form of a child in a year, 5 years, 10 years, or it might not. I know that His plans are SO big and good and true. I have peace that surpasses all understanding. I have a Word of movement, no longer of stillness. Where we're going, of that I'm not sure. Dare I say, I don't care where I'm going? Jesus is there - that's all I need to know. Friends, don't allow a circumstance in your life to dictate every avenue of it. This is a mighty hurt in my life, and it's a giant piece of humble pie to recognize the idol I've made a circumstance out to be. It's relieving but it's still hard. I know your "stuff" is hard, too. I understand. But if there is anything I am learning from this it's that our focus is so narrow and blinded, and when we use what little strength we have to put that on Jesus, our eyes are opened, and we can tap into His power, His strength, His resources. We may not get all the answers, and that's okay. We get Jesus; isn't that better than it all?